It is Saturday, November 8 and measurable snow is forecast for Monday and Tuesday. The bluegills have slowed down in their eating because of the cooler water temps, but the tomatoes and cucumbers keep growing. 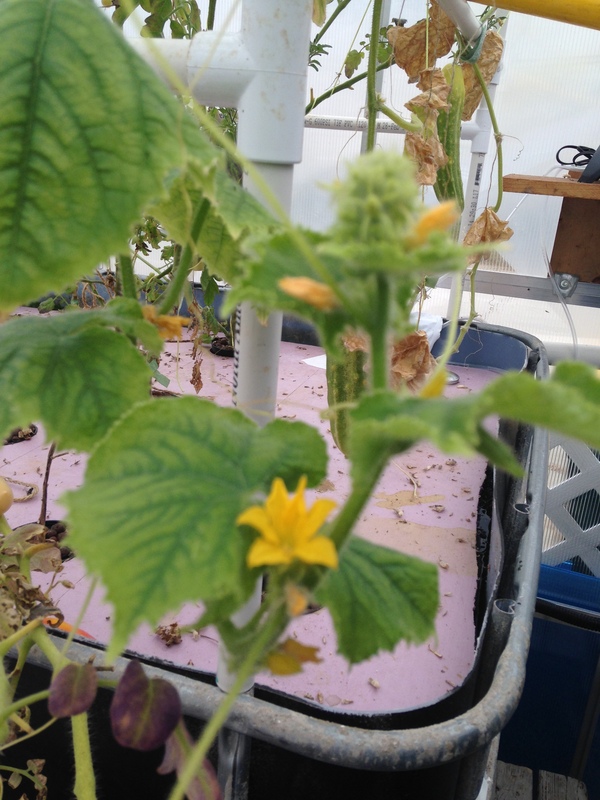 Two weeks ago, I topped the plants and removed most of the leaves to allow the fruit to ripen. The water temp today is 48 degrees and the plants will not give up. There are new shoots and blossoms and it is a shame to have to end this. We removed the fish, picked all the edibles, cleaned and drained the tanks and I will vacuum the floor tomorrow and place the tarp over the top before the snow. This was a busy first year. Along with the tank set and first season of edibles, the green house is now electrically wired independently. Today we talked about how we can make the green house warmer for this time next year to prolong the season further. 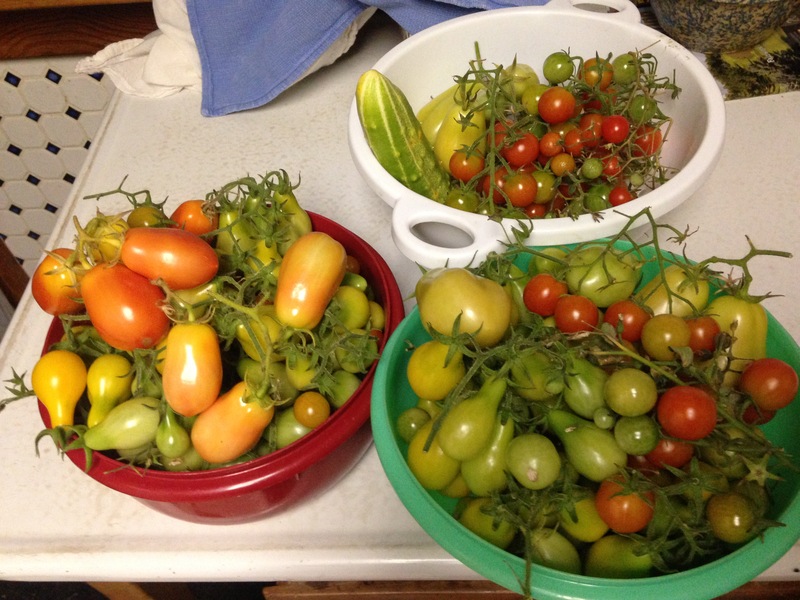 Now I am determined to help these tomatoes ripen properly so that we can eat each and every one of them. 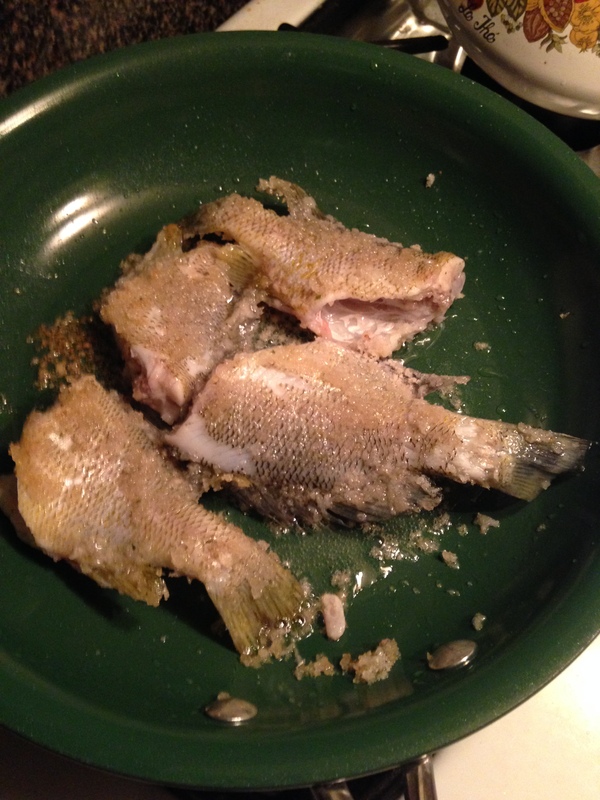 And this evening we had our first blue gill dinner. We have the next couple months to plan for next season. I just wish that we could come up with a feasible plan to have a continuous set up and not have to take down each year, but the reality is that it may be better this way. It gives us a break and we are able to start fresh and clean each year. It also gives us a chance to change things up and try new things. We will continue with the goldfish indoors through the winter months. We are experimenting with different lighting and lettuce seeds. It has been too long since our last post. 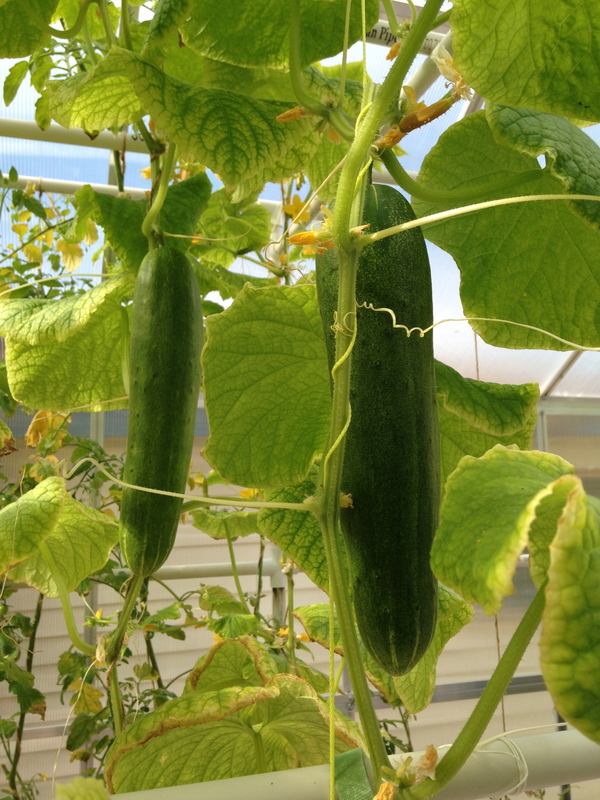 We would have to say that our first year in the the big greenhouse (GH2) has been a success. We started out with tomatoes, cucumbers, squash, zucchini and peppers, but ended up with tomatoes and cucumbers in the greenhouse and moved the peppers and zucchini out to the yard. 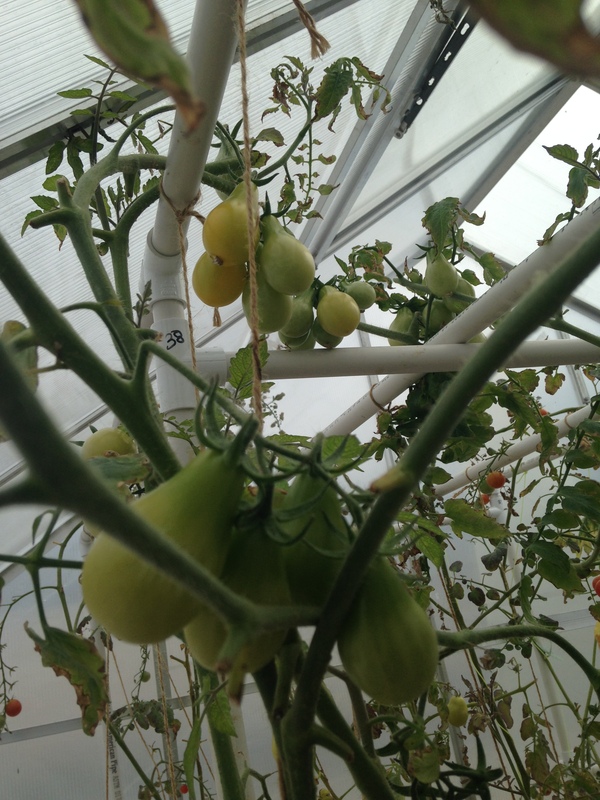 We visited Ledgeview Gardens in De Pere, WI during their open house and learned how to prune our tomato plants in ordered to have continuous fruit. 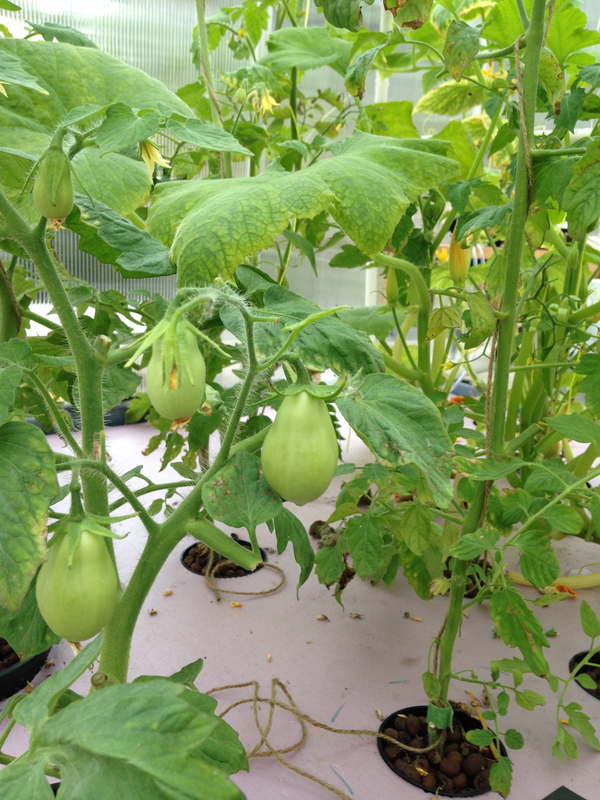 Their green house plants are feed hydroponically; I have never seen such tall tomato plants. From their advise, we were able to move forward. 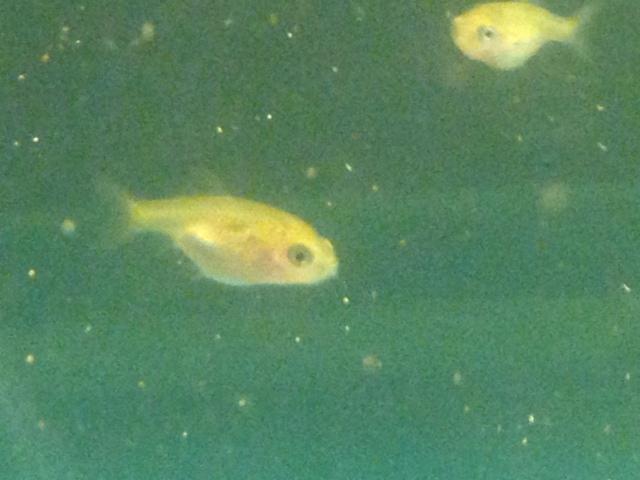 The bluegills worked out very well, but I think that we will increase the number of fish next year. 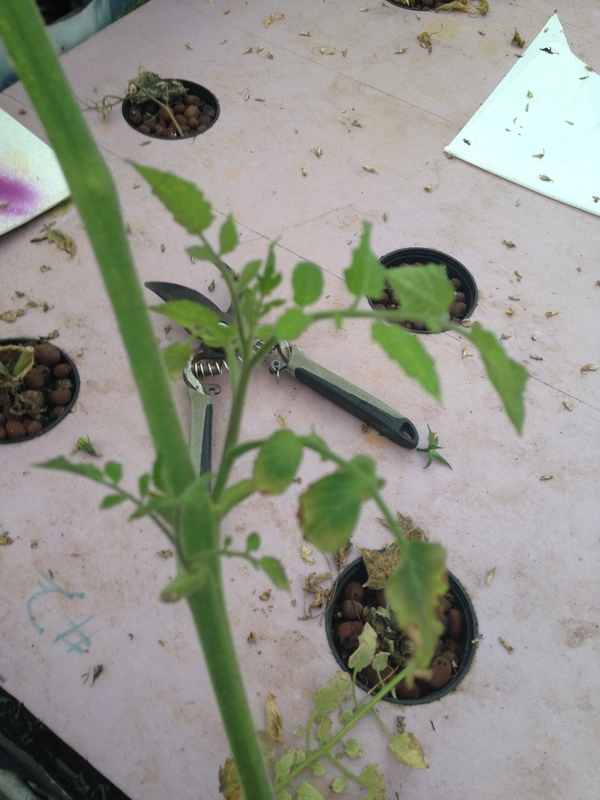 We always seemed to have pale leaves due to the amount of nutrients being pulled from the system. 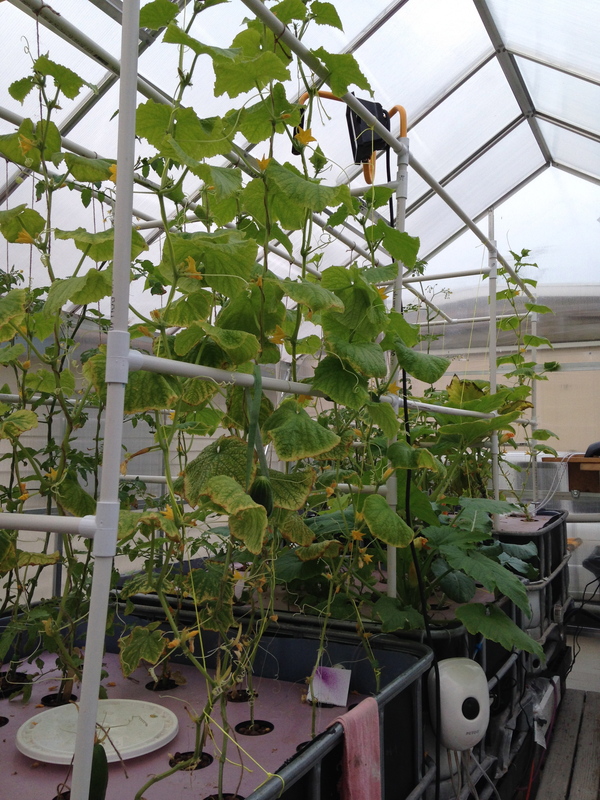 Our support structure eventually reached the ceiling to accommodate the height of the plants. This week, we visited Lone Duck Farm in West Bend, WI. We met Matt and Elise, who supply some of our area restaurants with fresh produce and tilapia. They have also launched a Community Supported Agriculture (a buying agreement between the farmer and people in their community) program for people to purchase weekly shares of produce. 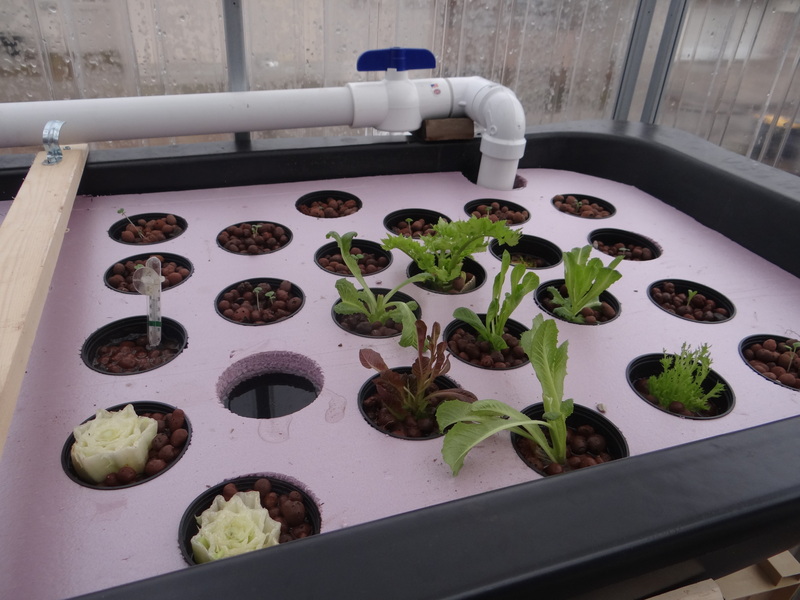 Here we were able to see how their successful aquaponic green house grows beautiful lettuce. Matt graciously answered the questions we had and gave us some advise on our own winter lettuce growing project. Please check out the blog sites of both Ledgeview Gardens and Lone Duck Farm. Most of these pictures are from June and July except for the last one on the right. 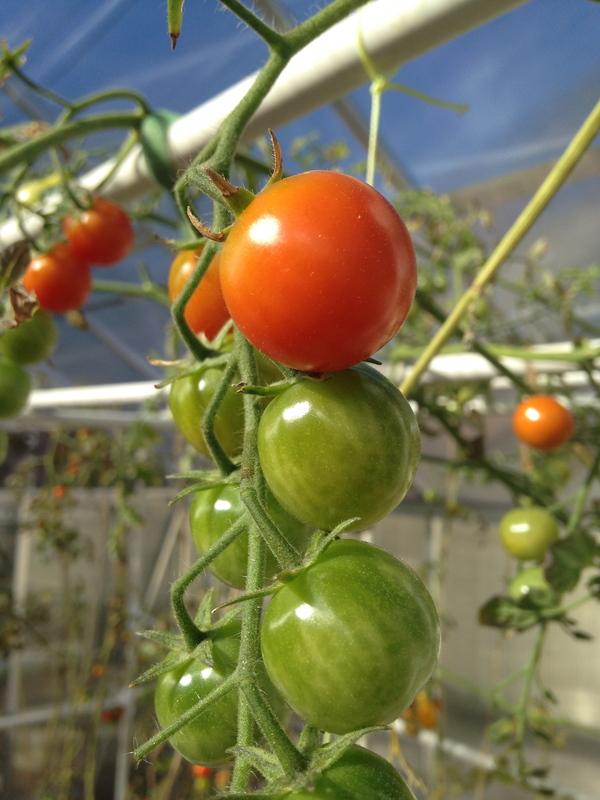 We have now topped the plants and removed most of the leaves to encourage the fruit to ripen with the cold nights. Our little joke is that the fruit grows and ripens by day and is refrigerated by night. This weekend will probably be the end of this season. 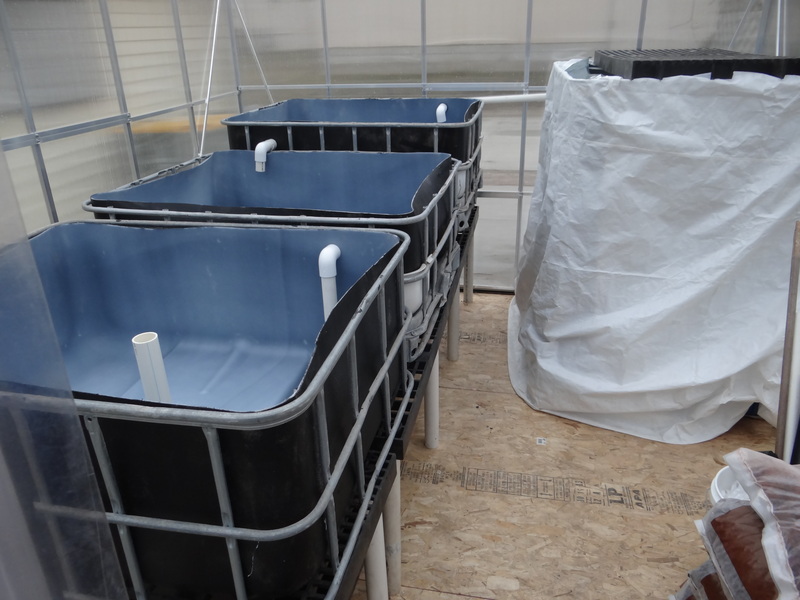 We will harvest the fish, pick the remaining produce and drain the system until February or March. That is the one nice thing about gardening, you always can plan on something in the near future. We have had the coldest winter in thirty year. All flowering trees and bulbs are three weeks behind in blooming. Lake Michigan is to the east of us and currently at a whopping 35 degrees F and when the east wind blows, it is quite brisk. 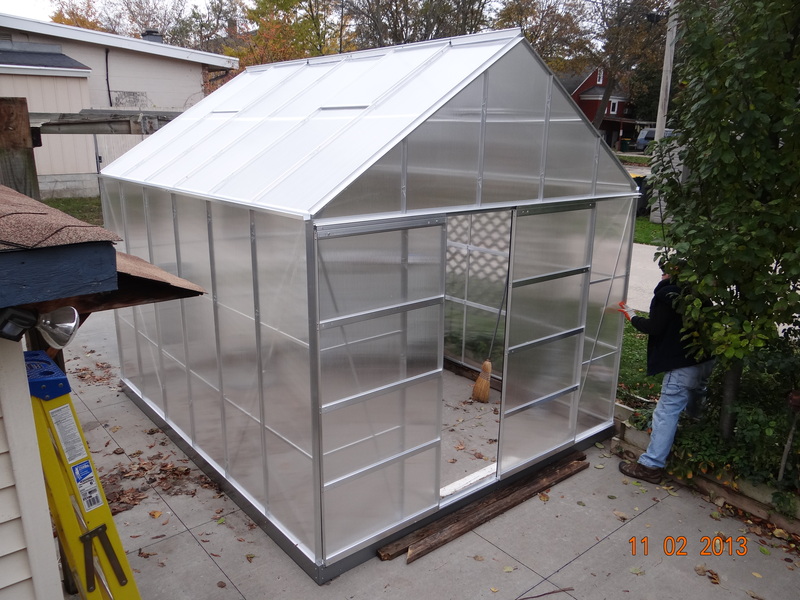 But, if you have a greenhouse, all is well, all is growing and all is warm. The regular farm community are just now thinking about turning over the soil, but are not able to plant crops. But in the green house I could start planting a month ago; all I need is sunshine. The only thing that set that process back was the drop in temperature at night. 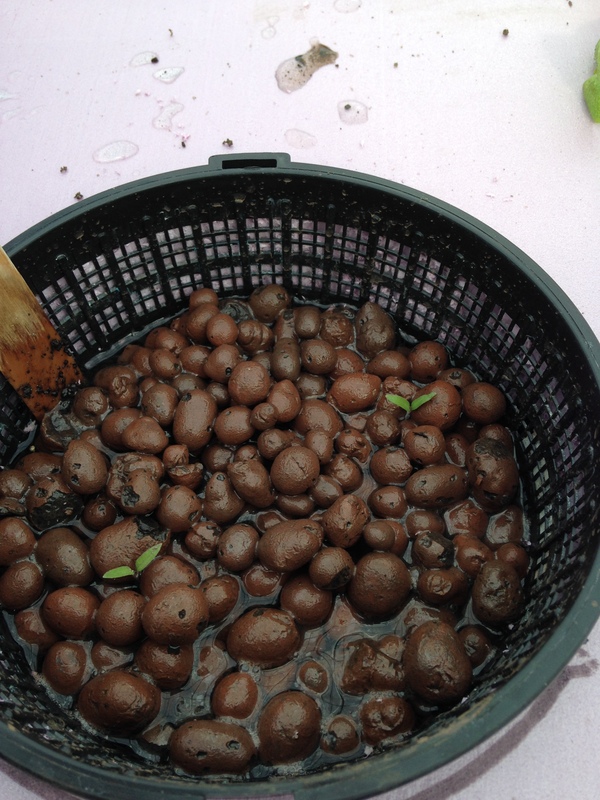 The potted seeds got too cold, some had to be re started. 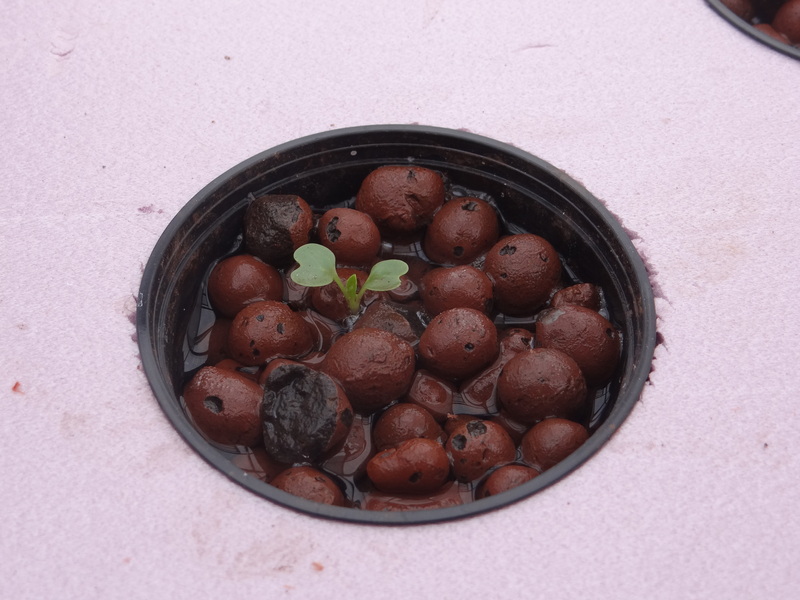 As the lettuce sprouted, we moved each plant into its own net pot to help the system cycle out while we wait for the other seeds to sprout. There are a variety of lettuces, cucumbers, zucchini and cores from store purchased romaine. 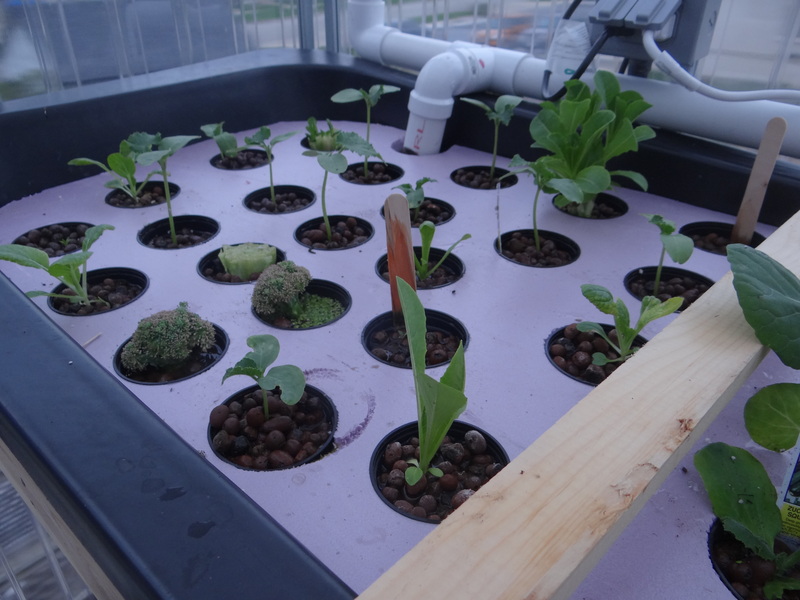 These cores will continue to grow if placed in either dirt or an aquaponics system. This is the best gardening project that I have ever done. Each day is more exciting then the next with the warming of the sun. I can’t see ever going back to traditional dirt gardening; to much watering, weeding and waiting for small results.For a 40′ x 120′ city lot, this compact set up is just perfect. At the same token we have 6 beautiful goldfish that are great pets. They are relaxing to watch and fun for our cats to view them at floor level. From these 6, we now have another nine baby goldfish that keep the indoor aquaponic system going with houseplants during the summer. I will continue to post our results through out the year. Last October we were more concerned about getting our goldfish indoors before the snow flew. The safest way in our minds was to keep them in the same water from outside and let it warm gradually. I knew that goldfish lay eggs, but I was totally unaware of the procedures or what to look for. We left the fish at a temp of 63F for about 2 weeks. I added a tank heater on low, but I noticed the fish were all nose first at the heater and the overall temp did not rise much. We purchased a more efficient heater and when the tank was 68F, the fish started chasing each other around the tank at 7:30 in the morning. At first I did not realized what was going on. After my husband explained things to me, I decided to separate the more aggressive males out until I got home from work. Oh great, we created Spring in December. By January, we have a 10 gallon tank set up with small polished stones on the bottom. This was a mistake because when the fry hatched and fell into the stones, I could not gauge what was needed. This batch did not survive. But not to worry, a week later the process stated over again with a bare bottom tank. Less of a chasing frenzy if you take the couple out and place them alone; first picture above. There are many stages, feedings, adjustments and cleanings as you go along. One handy tool my husband put together was a tank vacuum made from ice maker water line. 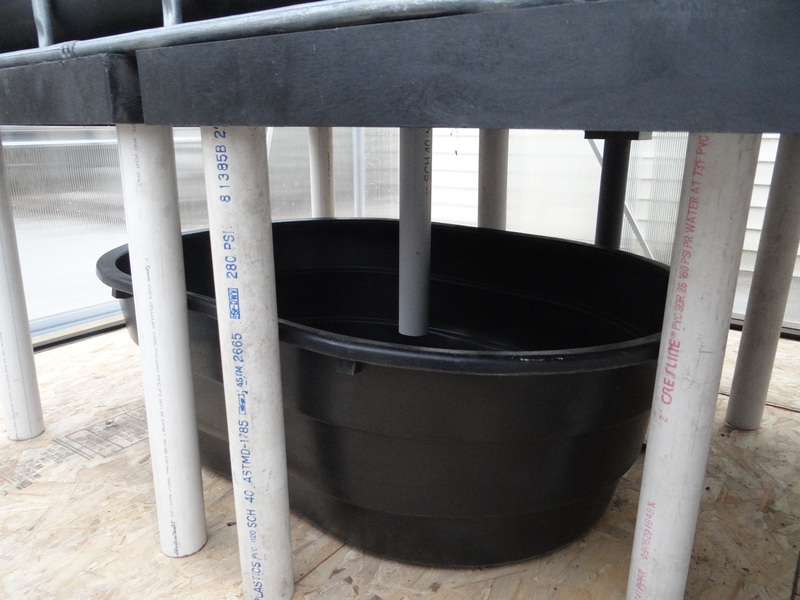 This tubing is thin that a small amount of water siphons through at a time without emptying the tank. He attached a one foot sturdy wire along side the last foot to keep it straight. This saved time when cleaning the tank bottom. I have kept a dozen of the many that were hatched; they are a good size and growing fast. 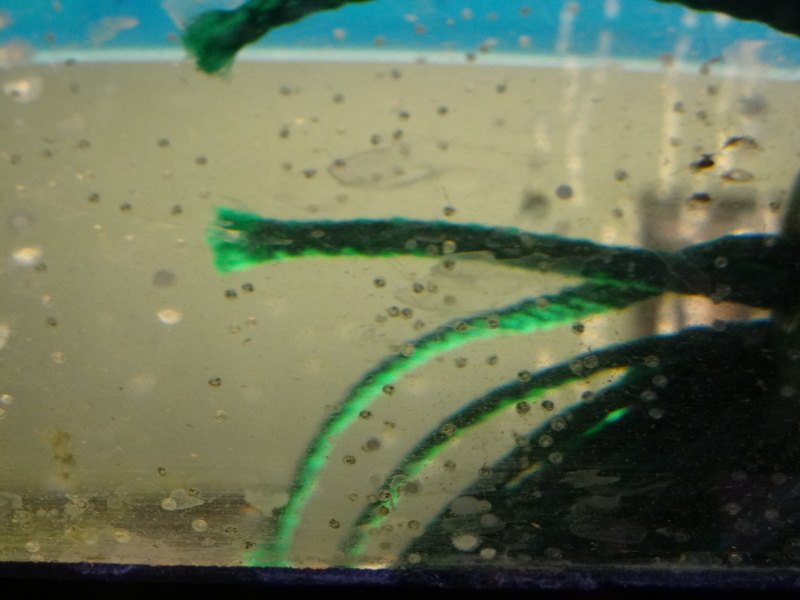 The water is in GH2 and running full circle from the fish tank through all three beds. 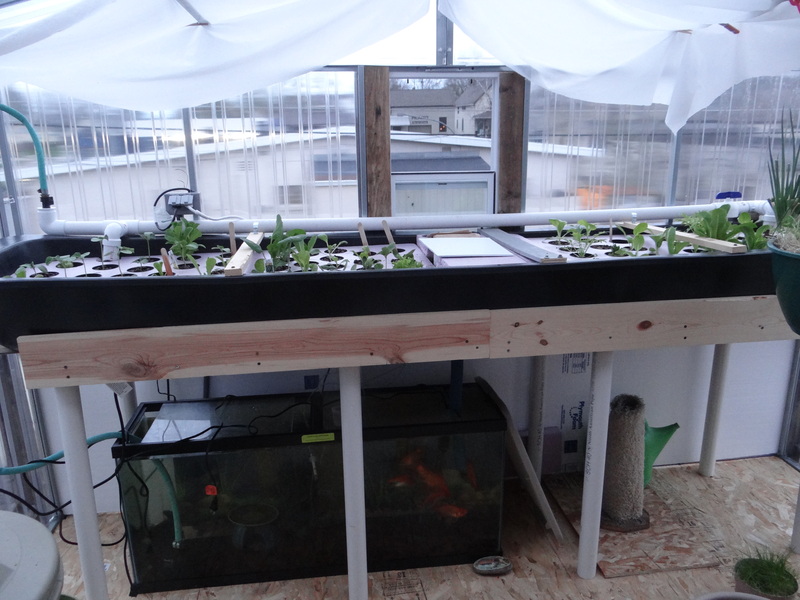 The rain we had last weekend allowed us to fill the 250 gal fish tank, the three 75 gal beds and the two 250 gal reserve tanks under the deck. What a blessing to have more than you need right from the start. 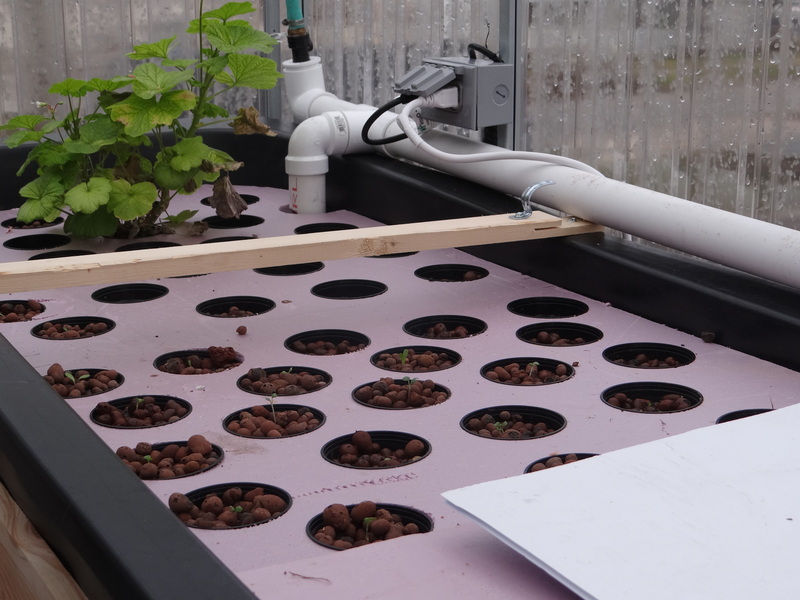 Each of the three beds has been fitted with foam and pots for the plants, along with 1/2 inch PVC pipe overhead for growing upwards. 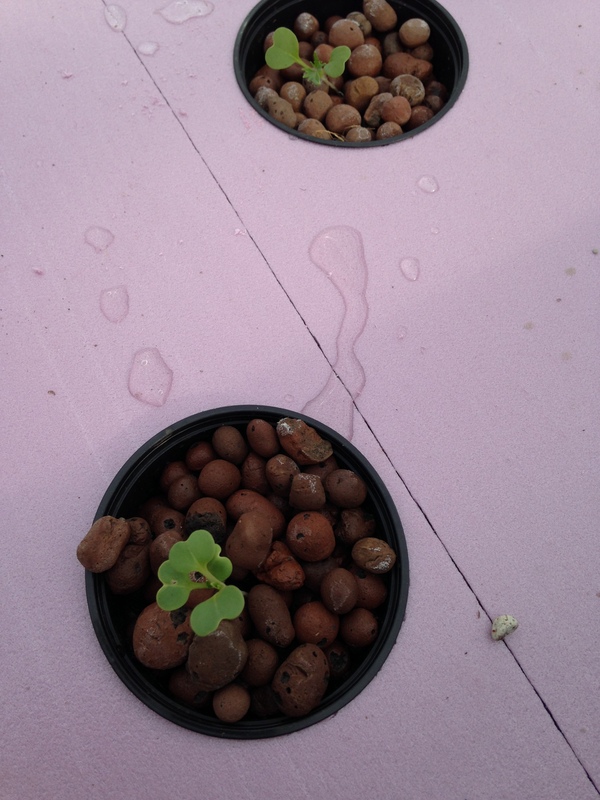 I took a water reading to find we are ready to add plants and wait for the system to cycle out. 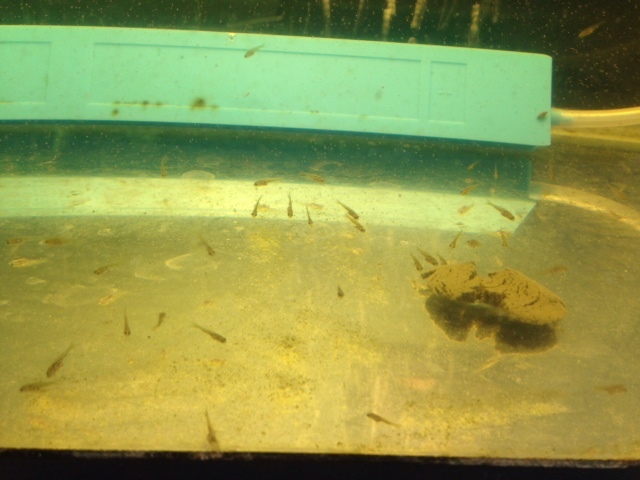 This means to form the proper bacteria that will break down the ammonia to nitrite to nitrate in order to feed the plants once the fish are added. 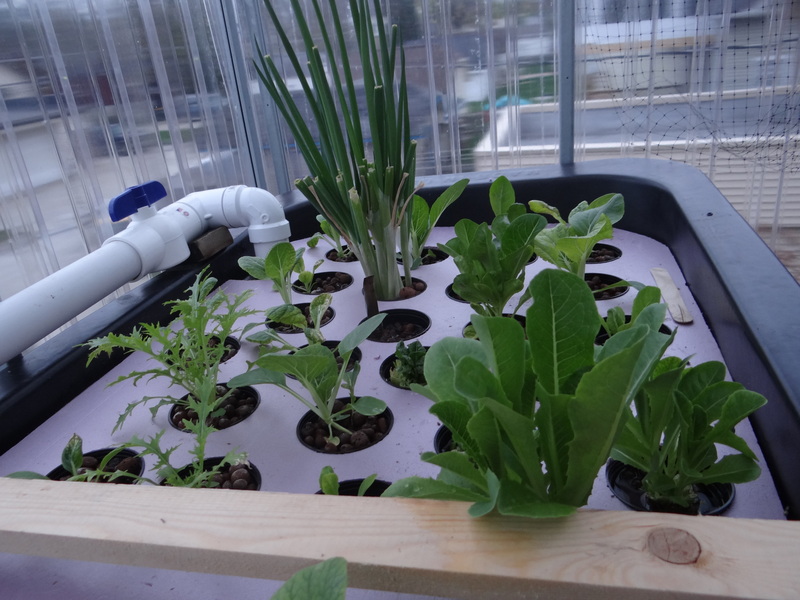 I added the lettuce sprouts from GH1 to these beds to help things along. 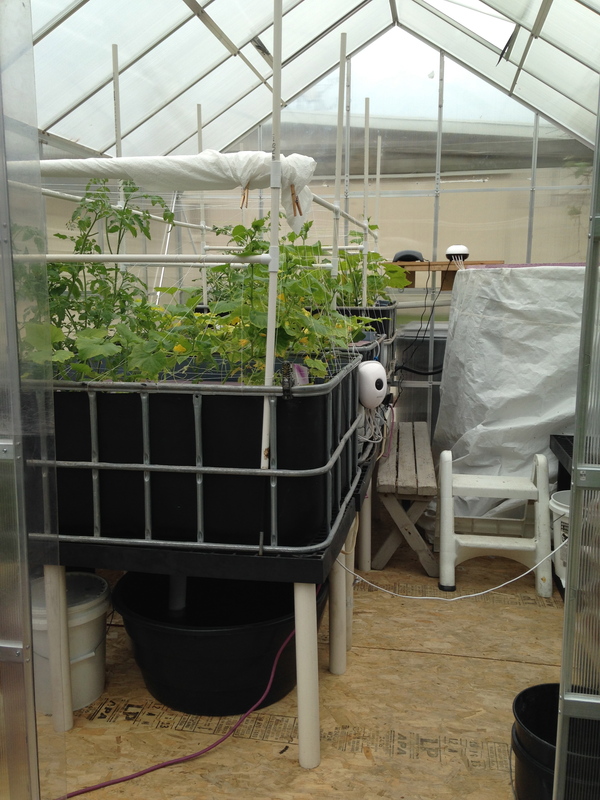 the pot on the right has cherry tomato plants. It is more important that this GH2 cycle out first so we can add fish. 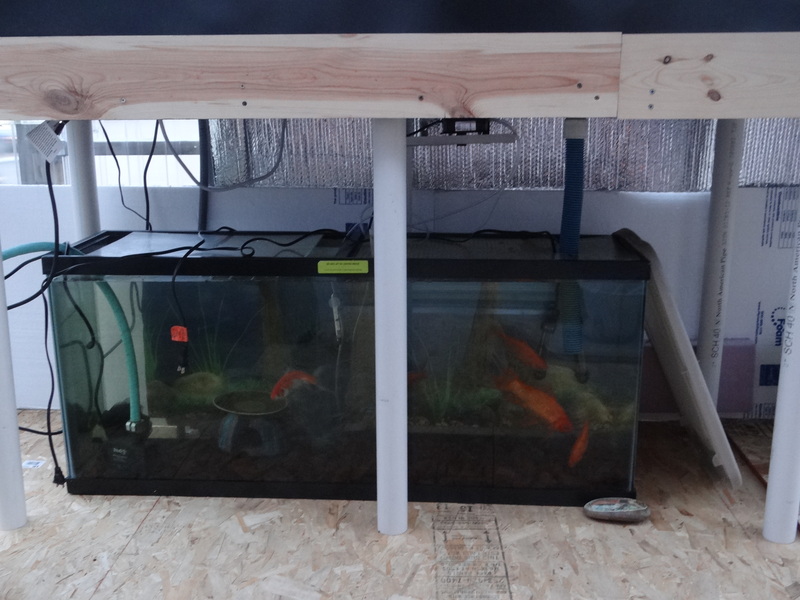 The goldfish from last year are in an established system indoors. 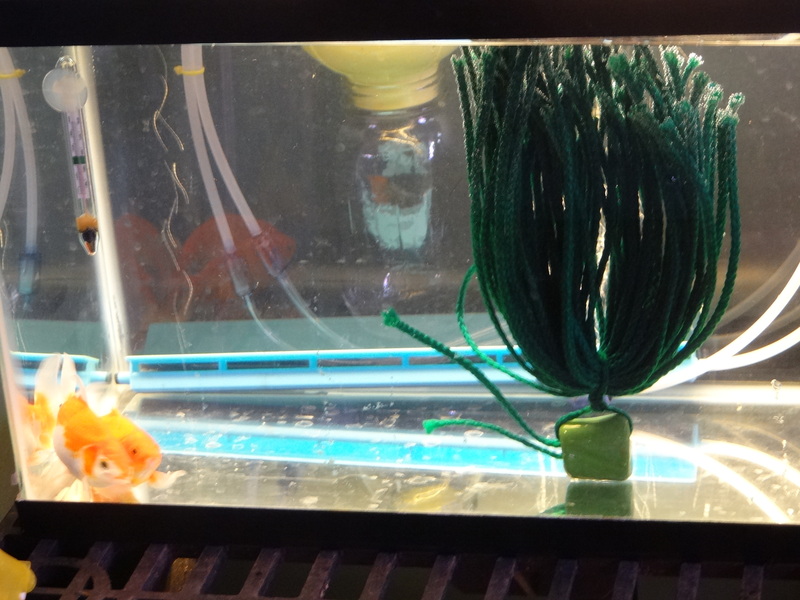 GH1 also has water cycling but until it is ready, the goldfish will wait until a little later. 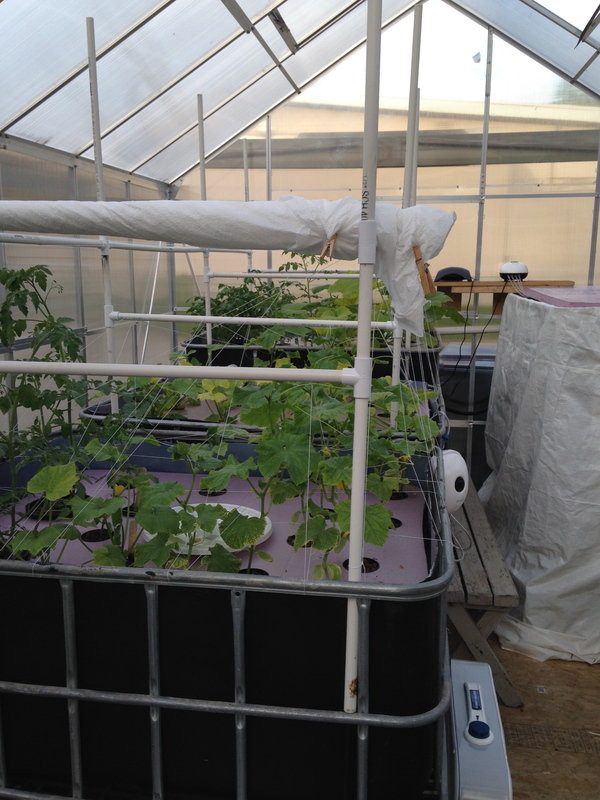 With a brisk east wind and sunshine, the temperature in the green house reached 90F today; outside temp was 52F. As you can see by the date on the picture, GH2 had just been put into place before last winter. We put in the floor, a couple of utility tables, an IBC and the expanded clay; wrapped a tarp around it to keep it safe from one of the coldest and snowiest winters and waited for spring. Now the inside has begun to transform. 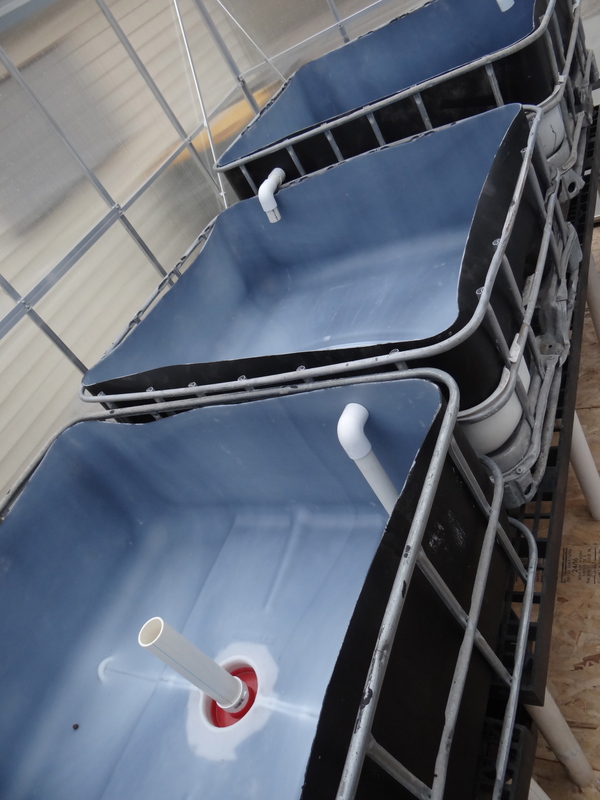 The first IBC will become a fish tank for wild fish. We have four additional IBC totes to help in this process. Two were cut into grow beds and the other two are for rain collection. 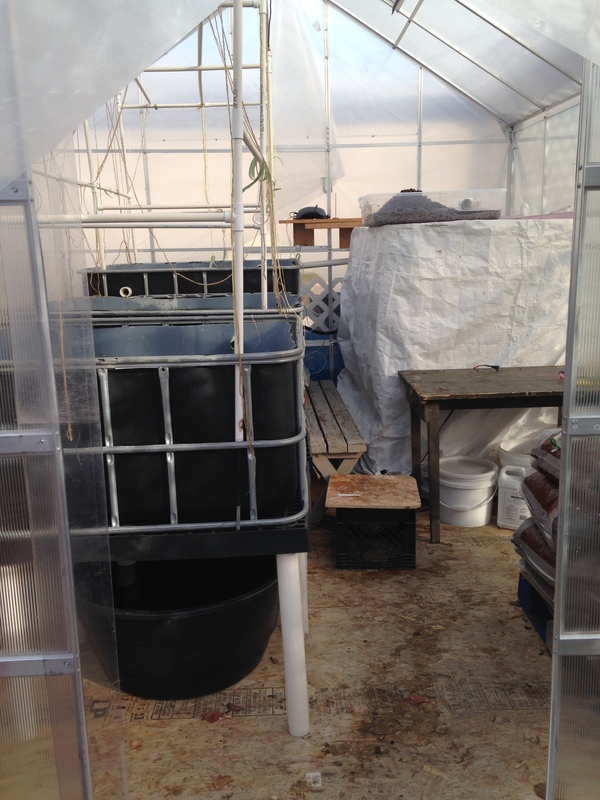 We cut a whole in the top of the fish tank tote, placed a tarp between the white tank and the tote cage to darken the tank inside and wrapped a white tent fly around the outside of the cage to help keep the tank cooler. 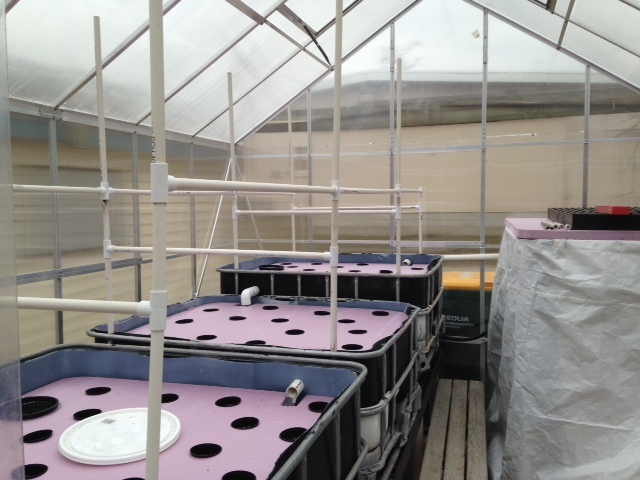 The outsides of the grow beds were painted black to keep algea growth down. 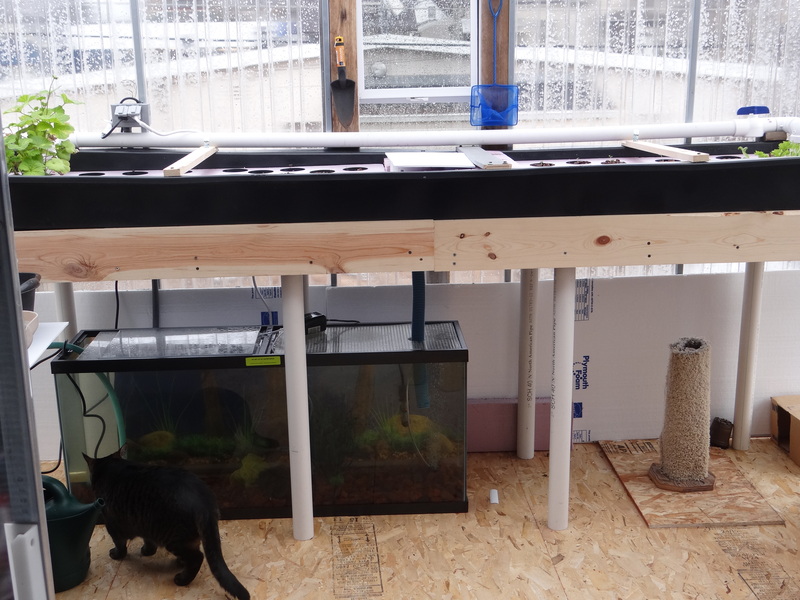 We ran a gravity feed pipe from the inside of the fish tank out to run through each of the grow beds and finally to the sump where the water will be pumped back into the fish tank. Just like GH1, these will have foam floats and net pots filled with plants held by expanded clay. I will post more pictures as we move forward. Thank you for reading our posts. I love this cleaner look. It has the same grow bed only on higher legs. The fish tank is now an actual 55 gallon fish tank and not a black 55 gallon drum. It will be easier to see how the fish are doing . The fish have been living in a tank just like this indoors over the cold winter months and we thought it would be easier to move them to their summer quarters if the tank was the same. The inside of the greenhouse feels bigger; giving us more room to move. We have changed the inside of the bed also. Last year we had lava rock to hold the plants in place but this year we have foam, net pots and clay. We did put a very thin layer of lava rock underneath giving the bacteria a place to grow. The funny thing is the lettuce in the right picture are from the grocery store. We places the romaine, celery and spring green cores in the established grow bed from the winter and they continued to grow. I have moved them out to see how they do. This bed will be home to different bean plants once the seeds sprout. 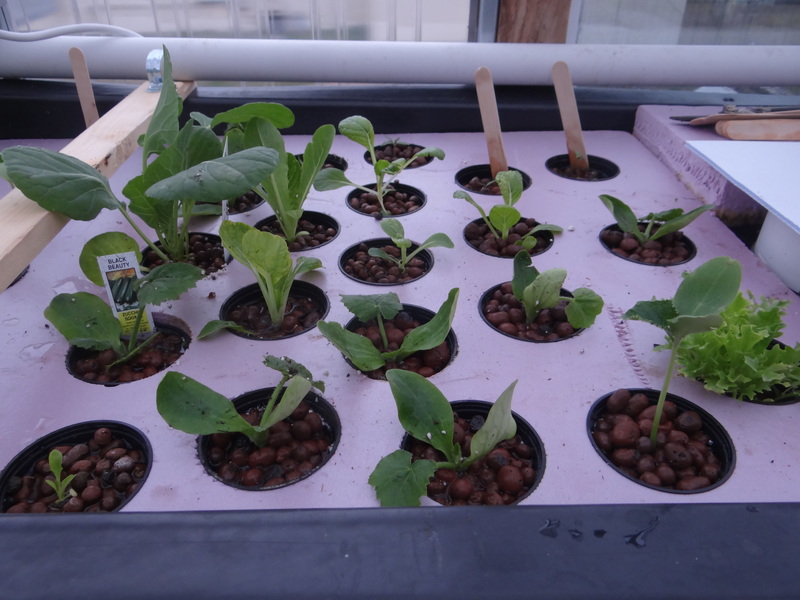 So far there is just the different lettuce varieties to plant. Hopefully in a couple of weeks, I can show you some real progress; so stay tuned.